Many of the 150 wild horses saved from threat of slaughter last year by a US rescue group are now ready to go on to new beginnings where they can once again roam and socialize freely on open pastures. 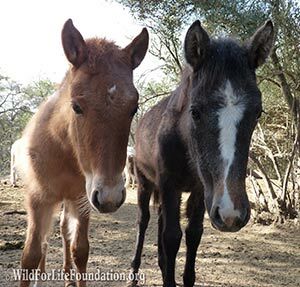 Rescued as part of the Wild For Life Foundation’s Monero Mustang conservation program, more than 150 horses, including foals, were taken in, with those considered not adoptable taken to the organisation’s wild horse recovery center. The horses were identified as being El Rito Spanish Mustangs – descendants of the Spanish horses brought to the Americas by Juan de Onate in the 1500s. The special Monero Mustang conservation program was established for their protection after they had narrowly escaped government eradication. This week the Wild For Life Foundation announced that the WFLF Monero-Mustang Rescue and Recovery Mission was nearly complete, with several of the horses nearly ready to leave the transitional recovery center in Southern California for new beginnings. The group is seeking assistance to help pay for transport, feed and veterinary care.